Photos from the Fall 2016 ArizMATYC Meeting. Join mathematics faculty throughout the state of Arizona for the Fall 2016 Arizona Mathematical Association of Two Year Colleges Conference. 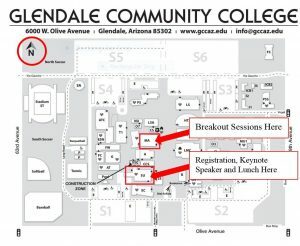 The conference will be held on Friday, October 14 at Glendale Community College in Glendale, Arizona. 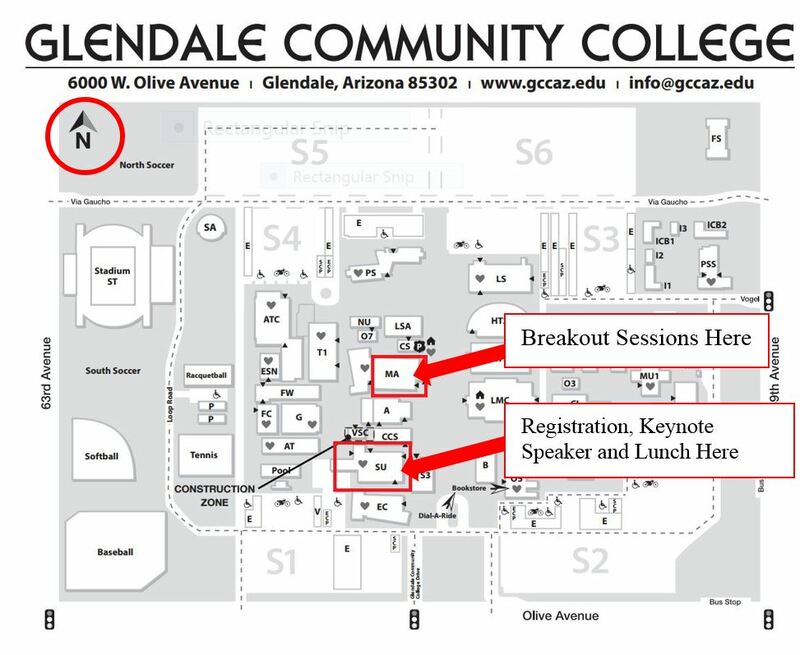 The conference will begin in the GCC Student Union Room 104, on the south end of GCC. If you are traveling via I-17, get off on the Dunlap Ave exit and head west to 59th ave. Dunlap Avenue becomes Olive Avenue. GCC is on the Northwest corner of 59th ave and Olive. If you are traveling via the Loop-101 on the north side of Loop 101 you can exit at 59th avenue and travel south to Olive. If you are traveling via the west side of Loop 101 you can exit at Olive Avenue and travel east to 59th Avenue. If you are traveling via I-10, it is suggested to transition to either I-17 or to the west side of Loop-101. When you arrive on campus please park in student parking. You may use parking areas S1, S2, S3, S4, S5, S6. While parking areas S1 and S2 are closer to the Student Union building, those lots tend to fill more quickly. Parking can almost always be found in lots S5 and S6. Proposal are no longer being accepted for the Fall Conference. Online registration is now closed. The conference fee is $15 and includes an ArizMATYC membership. You may pay on the day of the conference in person. Several vendors will be available at the conference. Vendors may purchase tables ($100 / $175) or a presentation ($100). Sponsorship is also available for the conference. Contact the ArizMATYC Treasurer (treasurer@arizmatyc.org) for availability. Conference rate is $120 plus taxes (currently 12.57%). (The regular rate for the nights of the conference is $159 per night, but Marriott Rewards members may get the room for less than the conference rate.) To get the conference rate, the guest must call Marriott Reservations (800) 321-2211 or (602) 944-7373 on or before Tuesday 09/13/16 and mention that they are a part of the ArizMATYC group.